Forget Tinkerbelle, the fairies in GCC Member Amanda Ashby’s new novel are evil and need to be slain. To make it worse, they’re sarcastic hipsters. Now tell me that isn’t a reason to read FAIRY BAD DAY out this month through Puffin/Speak. It’s going to be a fairy bad day. Amanda: I met my husband in England and we were over in France working at a camping ground in Brittany, but we decided to hitchhike to Paris (kids, don’t try this at home). Anyway, we were totally standing in the wrong part of the freeway and were just thinking that we were idiots because even if someone had wanted to pick us up, there was no way they could pull over because they would have to cross a merging lane. The minute we had that thought this huge semi-trailer comes tearing toward us like something out of Mad Max and just cuts all the traffic off to stop and pick us up. The guy even looked like some crazy French cowboy, but he ended up being really nice and he just wanted passengers so that he could stay awake (we really wanted him to stay awake as well so we talked to him a lot even though he didn’t speak English and while my husband had school-yard French the only thing I could do was buy beer!!). The rest of the week in Paris was amazing as well, but one of my favorite parts was getting that lift! Amanda: Snap! I didn’t know either! I knew that I loved reading books and that I was really good at creative writing, but being the slow learner that I am, I never managed to link the dots until I was in my mid-twenties. Weird thing is that I was recently talking to a friend from college and telling her this and she was really surprised, since she always seemed to know this was what I was going to do! As for what I was going to do, I really didn’t have a clue. I studied journalism but I knew pretty quickly that I wouldn’t be doing that because it was like the antithesis of everything I loved about writing. Still, it ended up being a great training ground! Amanda: Nothing special. In Australia the big thing we all celebrated was turning 21, which is pretty weird when you think about it, since our legal drinking age is 18 so there is nothing ‘special’ that happens at 21 but for some reason everyone had the most parties! For mine we hired out a quirky vegetarian restaurant and all my friends and family were there—though I nearly didn’t make it after having spent the afternoon blowing up balloon. Why are they so hard to do? Amanda: I’m not a natural outliner but I’ve been trying to get better at it because when I fly by the seat of my pants, I do a LOT of rewriting and I get quite frustrated at how hard it is to find the ‘real’ story. So basically I’m looking for a shortcut!!!!! 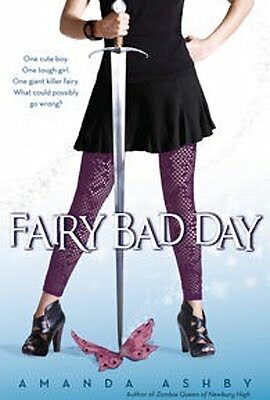 Amanda: Fairy Bad Day is the second book in a contract so instead of being exciting it was sort of nerve racking because while I knew that my publisher like the first book I really didn’t have any idea if they would want this one until I got my acceptance payment on the revisions! In fact all of my call stories are very unexciting because I don’t live in the US so due to the time difference, my agent and I do nearly everything by email!